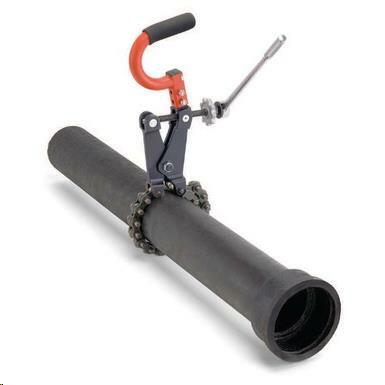 SOIL PIPE CUTTER TO 8"
The RIDGID 226 In-Place Soil Pipe Cutter is a compact, lightweight tool designed to cut hub 1 " (40 mm) to 6" (150 mm) and hubless soil pipe in tight quarters. Only 17" (43 cm) long, the Model 226 is perfect for cutting cast iron, cement and clay pipe where space is limited. The Model 226 is especially suited for against-the-wall and other tight quarter applications. From the Model 226's compact design to its unique chain latching mechanism, every feature has been engineered for maximum productivity. * Please call us for any questions on our soil pipe cutter to 8 inch rentals in Chagrin Falls, Cleveland Heights, Eastlake, Elyria, Lakewood, Lorain, Mayfield, Brunswick and Painesville OH, serving Northeast Ohio.